The Richmond Olympic Oval is going to blow the socks off of all those who are lucky enough to see it. It is fabulous. A piece of architectural masterpiece that will be a lasting symbol that will rival the Chinese Birds nest swimming pool of the summer games in Beijing. The forests of British Columbia are presently being ravaged by the Mountain Pine Beetle. These tiny little beetles, a little smaller than a grain of rice, leave thousands of acres of forests with dead and dying wood. An over supply of mature forest leaves the forest vulnerable to attack by natures forces. Although the trees die the wood can be harvested over the next five to eighteen years and still be usable. 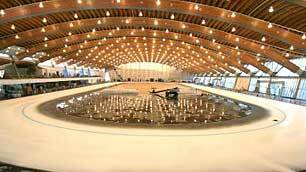 The Richmond Olympic Oval has a wood roof resembling a wave and incorporates wood harvested from the pine beetle damaged forest. The beetle effect causes a slight blue stain to the wood making it even more pleasing to the eye. On Friday Dec. 13th. the premier of British Columbia, Gordon Campbell, and Richmond mayor Malcolm Brodie officially opened the oval during the ribbon cutting ceremony at the complex two years before the 2010 Vancouver Olympics opening. The unique design has everyone thrilled due to its potential for a long lasting effect on the community and the province. The Oval will be the home of the speed skating venue during the games. It will also be the center for drug testing for both the Olympic games and the following Paralympic games. Soon the center will be open to recreational skaters where they will have the opportunity to create terrific memories by spending leisure hours skating on the ice where future Olympians will enjoy the feeling of victory or the agony of defeat. The cost of the oval was more than $175 million. The worlds elite speed skaters will begin to arrive at the oval early in 2009 for practice and training. During the 2010 Vancouver Olympic games the audience will be witness to 14 days of competition culminating in 12 medal rounds. Eventually, when the games have faded into the memories of the audiences, athletes, and the citizens of the beautiful city of Richmond, British Columbia, this magnificent edifice will become a wonderful community center. If you are lucky enough to be one of the ticket holders for speed skating events to be held here, you are in for an amazing experience in one of the most beautiful buildings in the world. All thanks to a tiny little beetle.